The ‘Tree of Life’ is intended to represent the pattern of evolutionary processes that result in bifurcating species lineages. Often justified in reference to Darwin’s discussions of trees, the Tree of Life has run up against numerous challenges especially in regard to prokaryote evolution. 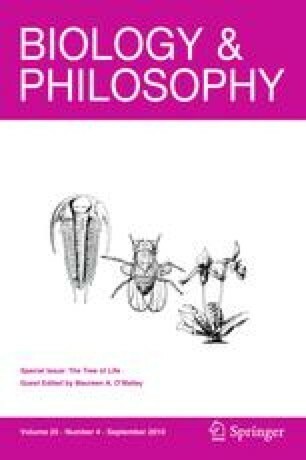 This special issue examines scientific, historical and philosophical aspects of debates about the Tree of Life, with the aim of turning these criticisms towards a reconstruction of prokaryote phylogeny and even some aspects of the standard evolutionary understanding of eukaryotes. These discussions have arisen out of a multidisciplinary collaboration of people with an interest in the Tree of Life, and we suggest that this sort of focused engagement enables a practical understanding of the relationships between biology, philosophy and history. The network and series of meetings on which this special issue was based are funded by the Leverhulme Trust, which generously underwrote a whole programme of research and events called ‘Questioning the Tree of Life’, http://centres.exeter.ac.uk/egenis/research/QuestioningtheTreeofLife.htm. This programme is based within Egenis, the ESRC Centre for Genomics in Society at the University of Exeter. We are grateful to several members of the network for comments on drafts of this introduction, and to Sabina Leonelli and Staffan Müller-Wille for additional discussion. The special issue is especially indebted to its referees, many of whom wrote detailed and constructive reports in very short timeframes. We list most of them, with gratitude, below. Rob Beiko, Yan Boucher, John Dupré, Betsey Dyer, Marc Ereshefsky, Arantza Exteberria, Laura Franklin-Hall, Lisa Gannett, Peter Gogarten, Todd Grantham, Matt Haber, James MacLaurin, Christophe Malaterre, James Mallet, James McInerney, Gordon McOuat, Greg Morgan, Staffan Müller-Wille, Maureen O’Malley, Thomas Reydon, Olivier Rieppel, Susan Spath, Joel Velasco, Rob Wilson, and Olga Zhaxybayeva.